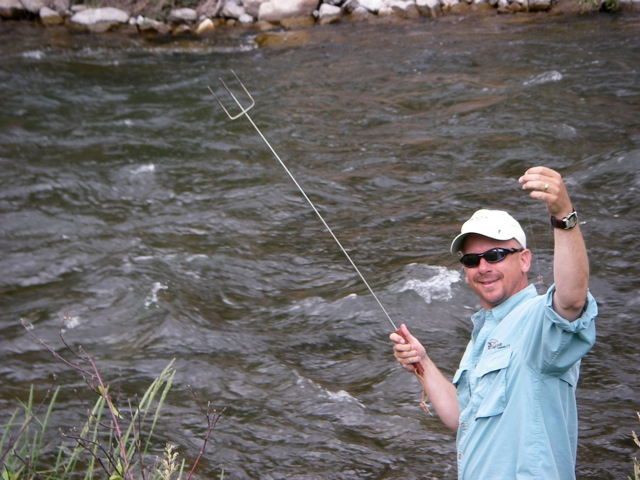 You don’t want to forget your rod and end up like this guy, fishing with a hot dog fork (story here). The first time, I took along the correct rods, but wrong reels and lines. Real smart, I know. Yes, I fished, but felt like a complete dope the entire day. The second time, I arrived at my fishing destination—far, far away from any supply shop—and discovered that I didn’t have a single tippet spool with me. In full panic mode, I rushed to see if I had left anything on one of the two the reels I brought and. . .yes! . . .there was a bright, shining leader on one of them: almost seven-and-a-half feet of what was originally a ten-footer. I fished that day, knowing full well that I wouldn’t be changing my fly anywhere near as often as I’d have liked to (four or five changes, total). By day’s end, I was fishing a pitiful six-footer that could barely fit any but the largest hook eyes. I caught a few fish, but it was a very frustrating day. Lesson learned: forgetting even small items, such as leaders, can really mess up your day. Some items are optional or do not apply, but they’re all there – whether you’re boating or wading. And don’t forget to check your vest/pack supplies regularly: pulling that last 9.25 inches of tippet from a spool is frustrating. No – scratch that – make that infuriating. Robert Morselli is the research director for the television show “How It’s Made.” A compilation of Robert’s fly fishing articles can be found at Fly Fishing Insider. Long before the advent of cell phones or my being granted a drivers license my mom took me to a local stream that remarkably held brook trout, both stocked and wild (the stream is within marathon distance of the city of Boston and has been sadly urbanized). I was dropped off in the empty lot I had been several times before and agreed to meet back at the appointed location. No sooner than the exhaust fumes of the old Ford dissipated I realized that I had left my reel at home. Well, that put an end to the fishing but I probably gained as much knowledge about where trout held in that little stream that day just by tramping along the banks and occasionally in the stream itself. The lesson for me? There is never a lost day on a trout stream – even when you leave the reel behind. I have an even more extensive list than that when I take off for 2-4 weeks. It’s useless, though, if you skip over an item because you “know” that it’s in the car! I make an annual pilgrimage to NY and PA from FL in the Spring each year. First stop was in NC for a couple days where I discovered that my Richardson Chest Box wasn’t there and my zillions of teeny tiny flies that I was going to need in PA were in it! I was devastated. Then! I called my daughter, who fortunately had a key to my apt, explained my dilemma and asked if she would FEDEX the box to the next campground I would be at in PA. Again, fortunately, I had made reservations and knew my itinerary! And when I made then move, the package was there waiting for me! License. Need I say more? My buddy Stef and I drove 4 hours to a river we knew of that held loads of salmon in the fall. After we parked he discovered that he’d left his waders at home. He spent the next 2 days fishing in his wading boots and boxers in some seriously ball numbing water. It was a sight to see, that’s for sure.